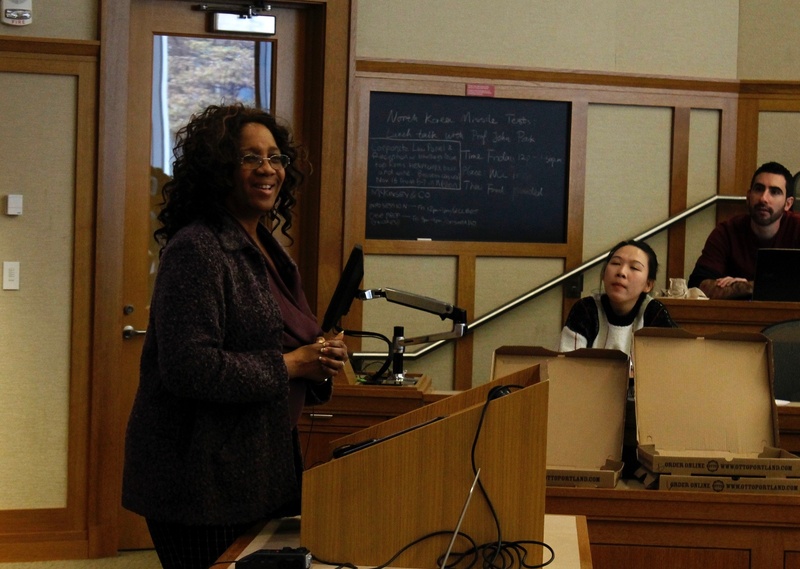 Valarie Long, an executive vice president of the Service Employees International Union, speaks about labor justice at the Harvard Law Forum on Tuesday afternoon. Labor advocate Valarie Long—who helps lead the 2 million-strong Service Employees International Union—argued for racial justice as a path to achieve broader economic justice at a Law School event Tuesday. 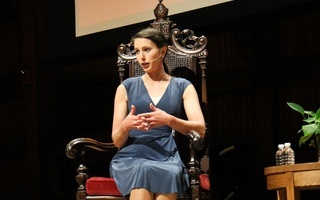 Long, who serves as executive vice president of the union, spoke for roughly half an hour Tuesday afternoon at a forum titled “Justice in the Service Economy” and hosted by the Harvard Law Forum. She discussed the work her union does, as well as current challenges confronting the labor movement in the United States. She opened her talk by detailing how her union represents workers across a wide range of industries: She said the group works with government employees, health workers, and property service workers like janitors. But Long spent most of the afternoon advocating for racial justice. She went on to assert that the right to vote—which she termed the most essential right to achieve racial justice—has recently come under threat from the federal government. Long said she was hopeful that the union and its allies could turn what she called the current “tide” of American politics. She also devoted much of her speech to what she called the progressive movement as a whole in the United States. She said that movement has suffered over the past several decades due to internal divisions and she called for greater unity going forward. “We have been siloed in our progressive movement. We have the immigrant movement, the criminal justice movement, the labor movement. It hasn’t worked...We need to join forces with folks who have like interests and common cause,” Long said. Roughly 25 Harvard affiliates attended the event. One attendee, Cara J. Kupferman ’20, said she agreed with Long’s emphasis on racial justice as a way to achieve broader economic justice for workers in the United States. “Especially given the current political moment, there is a more pressing interest in looking at issues of labor justice through lenses of racial justice and combining different movements to work for collective liberation,” Kupferman said. This impulse toward seeking the bad from anything good, to protesting progress for not being immediate utopia, leads to the most disturbing trend of the social justice warrior: a near-constant assumption of bad faith.